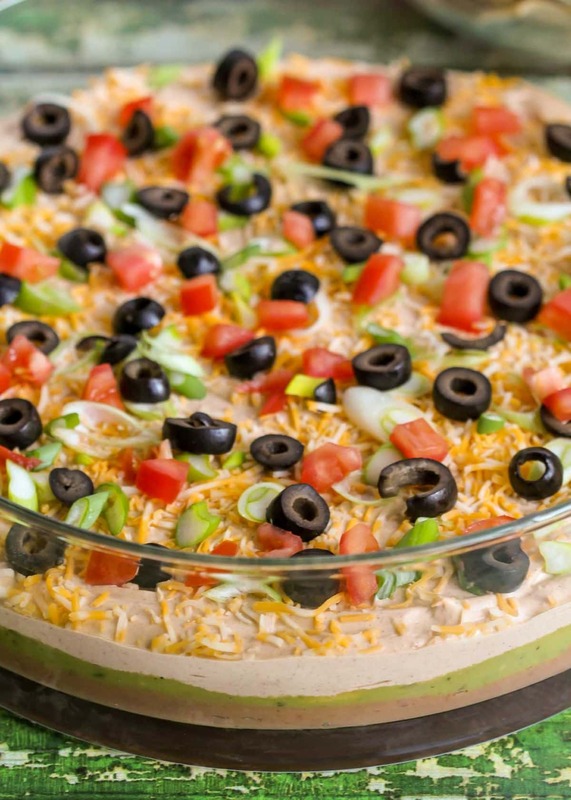 This is our family’s favorite 7 Layer Bean Dip recipe! It has loads of flavor and all your favorite dip ingredients including avocados, olives, tomatoes, cheese, guacamole and more! It’s a must-have appetizer at every family function. Hey guys! Last week I wrote a little bit about our family enchilada recipes. They’re all so yummy. I’m sure Kristyn has told you about how much we love to get together and eat all foods, but Mexican food is our favorite. 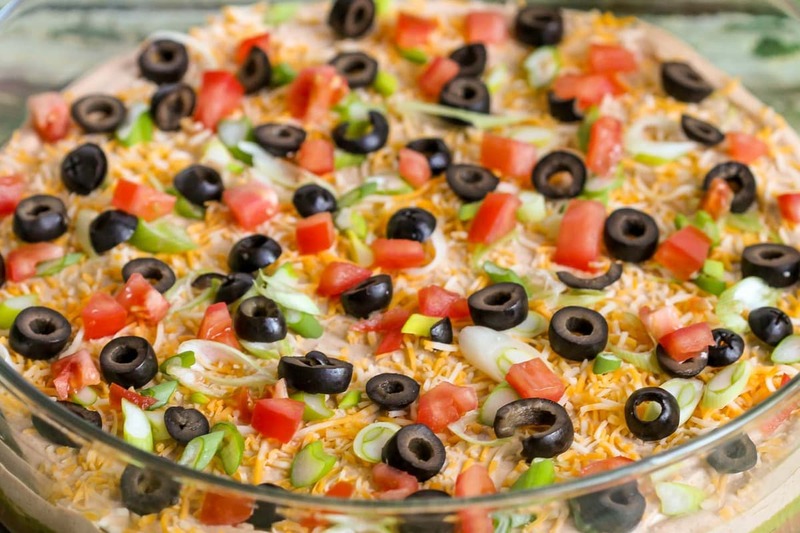 With those main dishes like Enchiladas and Beef Empanadas, we always have some scrumptious sides to go along with it like today’s recipe for our 7 Layer Bean Dip. 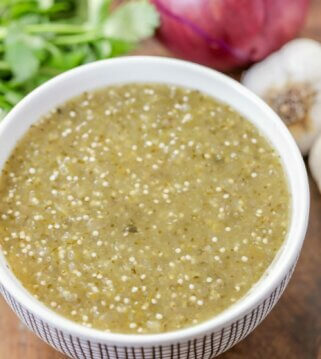 It is one of those appetizers that we always seem to have when we are eating Mexican food… especially for Cinco de Mayo. 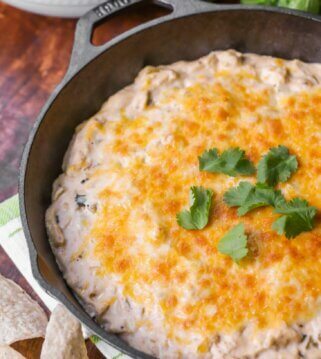 This bean dip recipe is simple and easy to put together. Spread it over a large platter to serve lots of people. We think it’s perfect for all those summer potlucks and family gatherings or for any Mexican meal. what are the seven layers in seven layer bean dip? 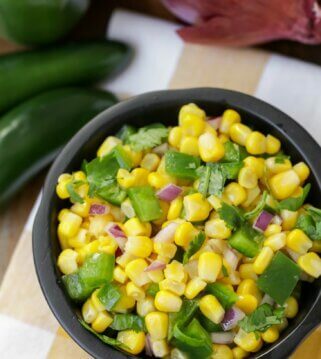 Your favorite green veggie – lettuce, green onions, jalapenos, or green chiles – all are delicious!! As with any of our recipes, they can be customized to your liking. We do beans, guac, sour cream mixed with Taco seasoning, chopped tomatoes, Mexican cheese, olives and green onions. It’s ALWAYS a hit!! How do you make a seven layer bean dip? Making this layered bean dip is so easy. Once you’ve picked the layers you want to include, prepare each one to go in your dish. We start with beans. 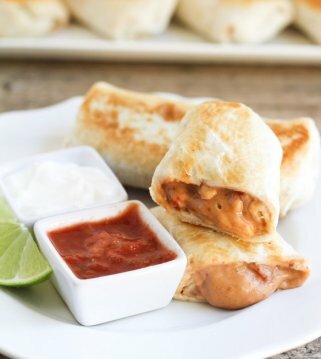 This can be made with your own version of beans, canned refried beans or even Frito’s Bean dip. From there we added guacamole. We like to use our homemade guac, but you can also use store bought guacamole. The next layer is sour cream (which you can keep on it’s own) or mixed with a package of taco seasoning. The top layers are all the toppings you love – olives, chopped tomatoes, cheese, cilantro/green onions/chiles/etc. It’s really that easy. What are the best chips to serve with layered bean dip? We have tried all sorts of tortilla chips, and our favorite chips are Juanita’s. They’re light, airy and crispy! Another favorite we like are Tostino’s Cantina Thin and Crispy chips. Can 7 layer bean dip be made ahead of time? We recommend refrigerating this bean dip for at least an hour before serving. If covered, this dip can be made up to 24 hours in advance. We just recommend waiting to add chopped tomatoes and the greens (cilantro, green onions, etc) until right before serving. How long does seven layer bean dip last? If covered properly, this bean dip can last for up to 48 hours in the fridge. The guac makes it harder to last longer, but it’s definitely a dip that can be enjoyed the next day. It can be served with warm tortilla chips or is great with Frito’s too. 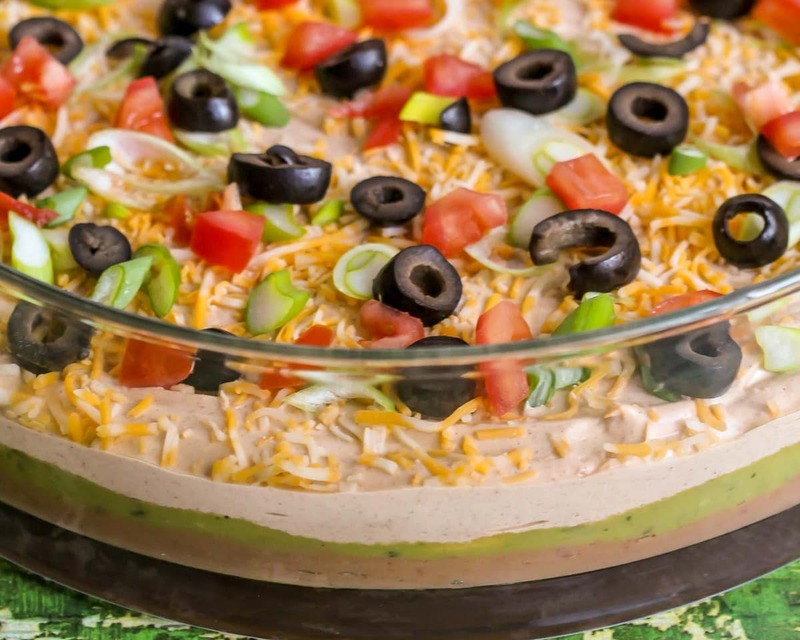 The fun thing about this 7 layer bean dip is you can add as many additional layers as you’d like. 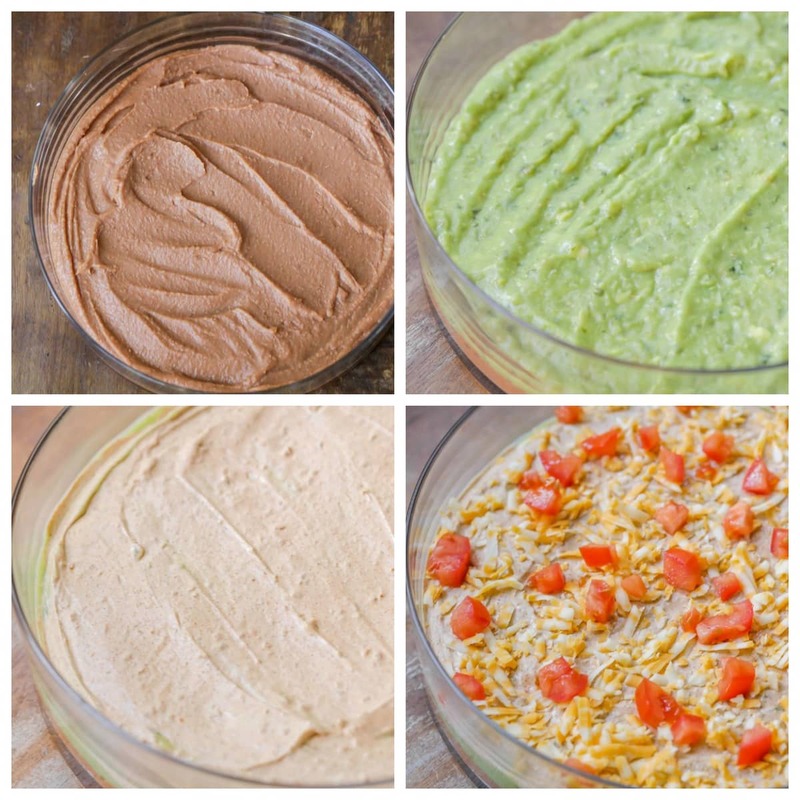 Avocados, corn, whichever ingredients you like in your bean dip. OR you can try making our Loaded Nachos which is pretty much this bean dip, cooked over cheesy tortilla chips! what to serve bean dip with? 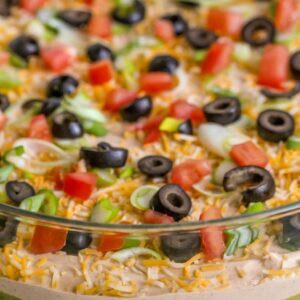 7 Layer Bean Dip - our family's favorite recipe with loads of flavor and all your favorite dip ingredients including avocados, olives, tomatoes, cheese and more! It's a must-have appetizer at most family functions. Layer ingredients one at a time onto a tray as follows... 1st layer - Frito lay bean dip, 2nd layer - Guacamole, 3rd layer - 1 cups each sour cream and mayo mixed with taco seasoning. Top with cheese, olives, tomatoes, and green onions. I love layered dip but I usually use minced olives. I love dip, too!! Minced olives would work perfectly in this!! This has become a party appetizer MUST-HAVE! Thx! I agree!! It is always gone in minutes! Thanks so much! My favorite appetizer to bring to parties! Thanks! Just made this for New Year’s eve, and it was delicious! mixing the taco seasoning with the sour cream layer adds so much flavor!